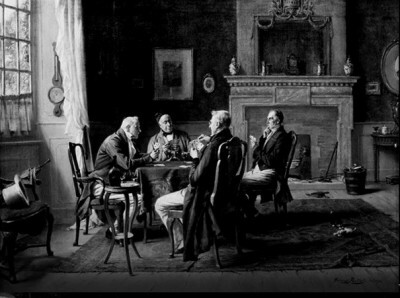 games were the favoirte form of gambling. 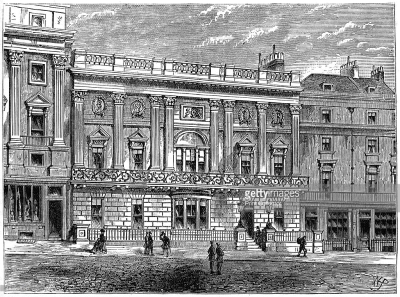 1783 it was known as the unofficial headquarters of the Tory party, while Brooks’s was the Whigs’ club. The establishment consisted of three stories, a basement and a dormered attic. In 1778 the front door was moved to the side to allow the addition of the bow window. either a white ball for approval or a black ball to indicated exclusion. It took only one single black ball to deny a man admission to the club. of pounds changed hands over frivolous bets or the turn of a card. raindrops on the bow window would reach the bottom of the pane first. Such bets could lead to financial disaster. Kloester, Jennifer. Georgette Heyer's Regency World. Naperville, Illinois: Sourcebooks, Inc., 2010, p. 118-125. Porter, Roy. 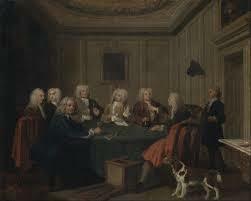 English Society in the 18th Century. London: Penguin Books, Ltd., 1990, p. 238. Woodley, A. "London Culbs." the Regency Collection. Jan. 2010. 12 Dec. 2016 .